Are you searching for a better check scanner for your property management company, bank or other small business? For those businesses in need of a check scanner to optimize their business’ finances, there are a ton of options out there that are worth consideration. Two of the most popular options for commercial entities include the Canon imageFORMULA CR-120 and Canon imageFORMULA CR-190i II. Each one serves a certain purpose, with the Canon CR-120 geared more toward the front-end application of the document scanning process, and the CR-190i II geared more toward back-end applications. 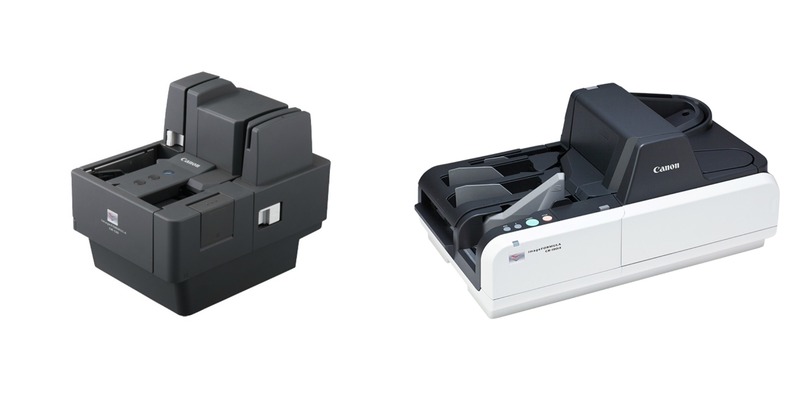 If you’re searching for a better way to optimize your finances, read on to decide which check scanner is right for you – the Canon CR-120 or Canon CR-190i II? When accuracy, speed and quality are crucial to your business operations, the Canon imageFORMULA CR-190i II will organize and optimize your financial transactions. Advanced features like precise magnetic ink character recognition (MICR) supported by OCR ensures you’ll always have consistent batch scans of checks, vouchers and coupons, alike. Another check scanner model within the same line, the CR-190i II UV, offers the additional benefit of UV sensors that help prevent check fraud. This check scanner is capable of handling large volumes of checks, improving the efficiency of both payment processes and treasury management in areas such as financial institutions, utilities and other large organizations. Many features of the CR-190i II check scanner are ideal for high-volume remittance processing, lockbox and back-office/branch capture applications. When paired with the Silver Bullet Ranger API, universal check scanner interface, this check transport can help ensure compatibility with every check processing software application on the market. Scans up to 190 items per minute, both sides of a document are scanned in a single pass. Ideal for business such as financial institutions, utilities, and other larger organization. Handles large volumes of checks to improve the efficiency of payment processes and treasury management. Straightforward maintenance, with the ability to change printer’s ink cartridge, clear jams, and clean scanning glass. The Canon imageFORMULA CR-120 is an easy-to-use digital check scanner with a smaller footprint than the Canon CR-190i II. This handy, compact device will increase the ability of your traditional check scanning process by increasing the speed, quality and processing capabilities of your financial transactions. With the additional features and its proven reliability, the CR-120 check scanner will help your smaller bank, credit union or retail store adapt to different financial situations – all while conveniently fitting on any counter-top where space is at a premium. With the integrated, space-saving magnetic swipe reader, the Canon CR-120 is capable of scanning up to 12,000 checks in a single day. This check scanner employs MICR technology to read code line data and capture grayscale images of both sides of the document. OCR software then reads the characters from the scanned image and cross-checks them using a unique algorithm to guarantee accuracy. Scans up to 120 items per minute. Simple, compact design, fits well on teller counters, merchant desks and work areas with limited desk space. A wide range of uses, but designed specifically for banks, credit unions and retail organizations. Ideal for moving paper checks and related documents. Magnetic swipe reader (MSR) to capture information from the magnetic stripe of a bank card. Built-in five line imprinter prints and captures endorsement information on checks. If you’re a larger, commercial organization, the Canon imageFORMULA CR-190i II will be your best choice. This scanner is capable of handling larger batches of documents and scans at a higher speed, giving you the power to process financial transactions in an orderly and efficient manner. If you operate a smaller bank, credit union or retail organization, the Canon imageFORMULA CR-120 is a good option. This scanner is an affordable, yet high-capacity device that will organize and optimize your financial transactions. Don’t Shell Out Money for a New Scanner – Try Our Repair Services!